Cloud assurance is primarily used for saving important data on cloud from cyber-attacks on account of the maintenance of the confidentiality of data from unauthorized access of the external participants. Additionally, cloud assurance ensures proper access control which includes authentication, authorization, and auditing to resources which has public or cloud provider. A range of security management tools include availability management, access control, vulnerability management, patch management, configuration management and incidence response. The services enables better management of security of cloud based data from threats and breaches. The global cloud assurance market is witnessing robust growth on account of increasing number of cyber-crime related activities across the globe. An increasing number of network breaches and data threats is expected to be a key factor boosting the growth in cloud assurance market. Rising concern among various organizations to boost the data security is also a key driving force for the growth of market during the forecast period. Increasing number of organizations are focusing on amplifying the reliability and accountability and reduce the risks involved in data lifecycle. The rising investment in cloud infrastructure by various organizations is also a factor contributing to growth of market. The cloud assurance market is expected to showcase a vibrant growth by the end of the forecast period. The market is expected to attain a total value of USD 25 billion 2027. The market is expected to expand at a CAGR of 16% over the forecast period. The market can be segmented on the basis of type, deployment, enterprise and end-use industries. On the basis of type, it is sub-segmented into cloud encryption, cloud database security, email & web security, cloud IAM (identity and access management), data loss prevention and network security. On the basis of deployment, it is sub-segmented into private, public and hybrid. On the basis of enterprise, it is sub-segmented into small & medium enterprise and large enterprise. The large scale enterprise sub-segment is expected to be the leading sub-segment. Increasing number of cyber-attacks is inducing large number of organizations to deploy various cyber security tools to protect important data and documents which in turn is expected to act as a key growth factor during the forecast period. Additionally, a large number of organizations are increasing the focus on enhancing the security of documents which is driving a subsequent rise in the cloud assurance market. Moreover, increasing adoption of cloud based services by various organizations is fueling the chances of network breaches and data thefts which is expected to increase the demand for cloud assurance. The increasing penetration of internet and smartphones across the various region across the globe is providing the benefit of cloud storage of data which increasingly demand safety from the cyber-attacks. For instance, according to World Bank, 43% of the world population used the internet in 2015 which rose to 45.7% in 2016. Lack of awareness regarding availability of various cloud based security services available in the market is expected to restrain the growth of market during forecast period. 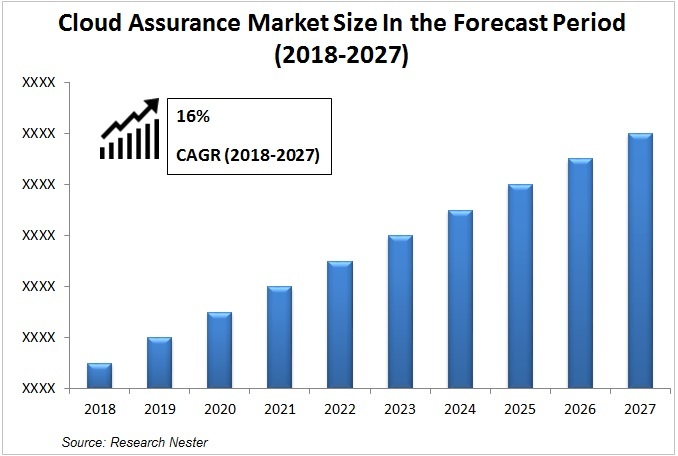 Limited knowledge amidst the small organizations in the developing countries is expected to hinder flourishing growth opportunities for market players cloud assurance market landscape. On the basis of regional analysis, global cloud assurance market is segmented into five major regions including North America, Europe, Asia Pacific, Latin America and Middle East & Africa region. North America is expected to be the largest region in terms of market revenues. Growth in North America Cloud Assurance Market can be attributed to an increasing demand for cloud based security applications by various organizations. Asia-Pacific region is expected to be the fastest growing region during the forecast period. An increasing expansion of various enterprises in the region is contributing to the growth of market. Additionally, increasing data threats and cyber-attacks is also a factor for the expansion of market during forecast period. For instance, National Crime Records Bureau, India the total number of cybercrime in 2015 was 11,592 whereas it grew to 12,317 in 2016.